io9 Annual Costume Show: Happy Halloween! 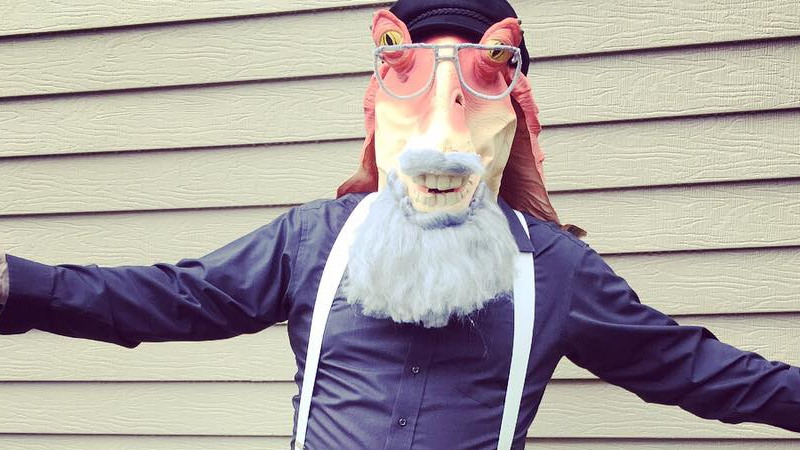 Image: Kinja User Dantilles’ George Jar Jar Martin! The big day is upon us, and that can only mean one thing on Halloween—it’s time to put on those costumes you’ve been working on and delight and spook us in equal measure! We’ve been asking you to send us pictures of your final costumes and works-in-progress for the last few weeks, and here are our favorites so far. We’ve had some lovely entries in this year’s Costume Show so far over the last few weeks, and you can see some of our favorites below. Be sure to check out the links to see everyone’s delightful pictures, too! Gravity Falls better watch out now that AMG OMG has resurrected Bill Cipher! Spike1382 hunts the most dangerous game of all—William Shatner in his prime—in this lovely Gorn get up. Arnoc got the face paints out for a lovely Frankenstein’s Monster. Or maybe that should be Frankenstein’s Internet Commenter? Beetlescoot42's family turned themselves into a cavalcade of characters, including No Face from Spirited Away, Mega Man, Sammy from Bendy and the Ink Machine, and even a Nyan Cat! KimDom turned an inflatable dinosaur costume into an audiovisual epic with a system to create gesture-controlled sounds. Seriously cool—click the link to see the instructions how to do it yourself! AmandaGeisel’s whole family did the most adorable Futurama cosplay, including an excellent baby Nibbler and Seymour the dog! Here’s an up-close look at Dantilles’ wonderfully punny George Jar Jar Martin from the header image. A+ pipe cleaner work on those specs. LaDracul’s David Haller is here to mess with your mind! Scam66's duo cosplay gives life to not just Peter Pan, but his shadow too! Hdfw’s dog Elliott helped a certain Extraterrestrial phone home with this adorable doggie cosplay. In Soviet Russia, Red Son’s Batman and Wonder Woman cosplays Mike and his wife! Vinnyguzzo and his wife make for an excellent Ghost Rider and Phil Coulson. Look at that SHIELD shield! Spaceman Bill Leah’s costume gets all palindrome-y on us with a Taco Cat. Get it? Still not shared what you’ll be wearing this Halloween? Show it off in the comments, providing pictures of yourself—and only yourself—as well as a little bit about who you’re dressed up as, and and how you put the costume together. For all of you going out for costumed fun today, have a happy Halloween from all of us at io9!